End Animal Slaughter contributor Maya Cohen-Ronen and her family recently paid a visit to Maui, where she was reminded that sanctuaries, not slaughter, are the way of the future. If you raise your head to the sky you might still be able to catch a glimpse of me, floating amongst the white clouds. I’m finding it very hard to land back down after spending almost two weeks in Hawaii, mainly on Maui. Holidays can be relaxing just as much as stressful, but this holiday was simply perfect in every way. Perfect timing, perfect location, perfect mind-set. It all clicked. There is only one word to describe Maui: Magical. In many ways it reminded me of New Zealand, but still, it differs. So much smaller than New Zealand, on Maui amazing scenery is always at your doorstep, and encounters with breath-taking nature are an easy reach. Amidst towering coconut trees and sandy beaches, beautiful wild roosters roam free everywhere you go, large and small sea turtles sunbathe fearlessly, and humpback whales with their steaming blow holes dot the water as far as the eye can see. It’s hard not to gasp with excitement at the site of a fully-grown humpback jumping out of the water for a spectacular breach, or spinner dolphins entertaining you with their playful turns. Snorkelling the pristine waters of Lanaii, schools of Humuhumunukunukuapua’a fish greet you, as well as other spectacular fish and sea turtles. I saw the most incredible sunsets on Maui, the sun tinted shades of orange, drawing bright stripes of gold on the darkening blue canvas and leaving a long sparkly veil on the gushing surface of the sea. Only Maui’s sunrise can rival its sunset, and nowhere is the sunrise more breathtakingly beautiful than the one observed from the top of Haleakala, Maui’s dormant volcano, which peaks at over 10,000 meters. The vegan revolution has certainly reached Maui, and finding delicious vegan food is easy almost everywhere on the island. The chain ‘Down To Earth’ blew our minds. It is everything ‘Commonsense Organics’ should have been, and more. It is organic and completely vegan-vegetarian, and includes everything from toiletries and personal care to supplements, cooking products, and cleaning detergents. A large variety of fresh fruits and veggies of all kinds welcomes you inside, followed by wall upon wall packed with an astonishing selection of vegan cheeses and dressings, pizzas, fake meats, vegan ice creams and snacks. I had the most delicious vegan “Buffalo Wings” there, complete with a fake sugar-cane wishbone. Yum! ‘Down to Earth’ also has a huge salad bar, offering a wide selection of fresh salads, hot meals and soups that you can buy on scale, and there is a bakery with an incredible selection of vegan doughnuts, muffins, cookies and more. This place is a vegan magnet, and we found ourselves drifting towards it even when it was not included in our daily plan, going back like addicts to get our vegan fix, again and again and again. And yet, with all its beauty and visible magic, behind the scenes and away from tourists’ and residents’ gaze, animals are brutally killed on Maui too. Wild pigs, deer and goats are hunted, and farmed animals are slaughtered, just like everywhere else. The taste for cooked dead flesh seems to be ripe, and barbequed marinated corpses draw the crowds, even when their well-identifiable bodies are cooked openly on the side of the road, like the baby piglets browning on a huge barbeque I saw on the way to Kihei. People who gasp, ooh and ahhh at the site of fish on the reef have no apparent issue with consuming said fish when offered up dead with a slice of lemon on a fancy plate. Tourist audio guides see no ethical problem pointing out herds of beef cows grazing peacefully on the lower slopes of Haleakala, advising that you can eat these innocent animals, fashioned into hamburgers, if you visit such and such a restaurant. Even in such an idyllic setting, there are still many compassionate education opportunities to be held. I didn’t encounter any Animal Rights activism while on Maui, which doesn’t mean activism doesn’t exist there, only that I missed it. What I did see, though, was a magical place called Leilani Farm Sanctuary, a refuge for rescued farmed animals and a real beacon of light and hope. Leilani is not only a heart-warming place of compassion, it is also aesthetic and well kept. Its gardens are meticulous and rich, carefully manicured and inviting. The founder’s little house on top of the hill, complete with over 40 snuggly cats, looks like it came out of a fairy tale. The lush green pasture is dotted with animals that are visibly relaxed and happy: donkeys, goats, sheep, deer, pigs and a cow, and even a couple of tortoises. The founder, Laurelee Blanchard, is a lovely lady with a big smile, who has turned this place into a slice of heaven. The message “go vegan” is displayed here and there on beautifully decorated signs and brightly coloured pebbles. When she guided us through the sanctuary we had the opportunity to hold some of the residents, and interact with others by feeding them, brushing them, and walking alongside them to pasture. It was the first time for me to hold a rooster and a goose close to my heart. I discovered that roosters and hens are naturally very clean. Cuddly Charlie the rooster smelled so good, and loved being held. 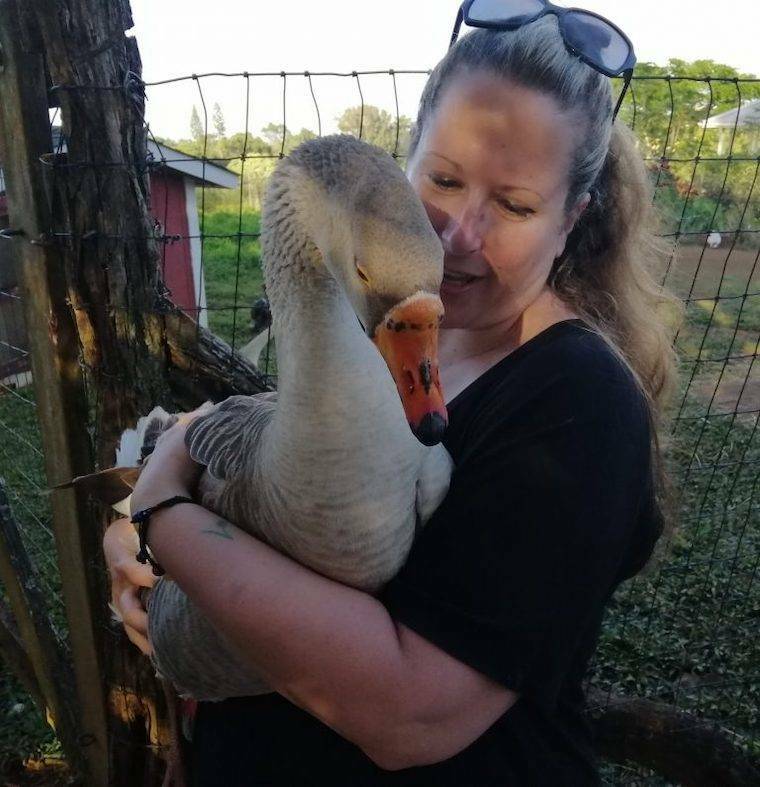 Patrick the goose was very soft and gentle, and had a charming personality. Laurelee encouraged this sort of interaction, making our visit with the animals so much more personal and memorable. Each animal’s story was shared with us as we met them, each a lucky survivor of a dire fate. Some animals were brought in by farmers who couldn’t bear the thought of the animal they grew attached to being slaughtered. Some were brought as babies by remorseful hunters. Some were live-rescued from animal hellholes. And there is also Berney the gentle wild pig, who was fortunate enough to just stroll in one day! We laid in the grass with Jenny, the beautiful donkey, deeply appreciating what this place offers its gentle residents. A visit to Leilani Farm Sanctuary of Maui is truly a boost to one’s morale. It suggests that even here – where animal exploitation still happens out of sight – there are enclaves of happy animals, spreading hope for a better tomorrow.